KANSAS CITY, Kan. -- The designer of a waterslide where a 10-year-old Kansas boy was decapitated has pleaded not guilty to second-degree murder in the boy's death. 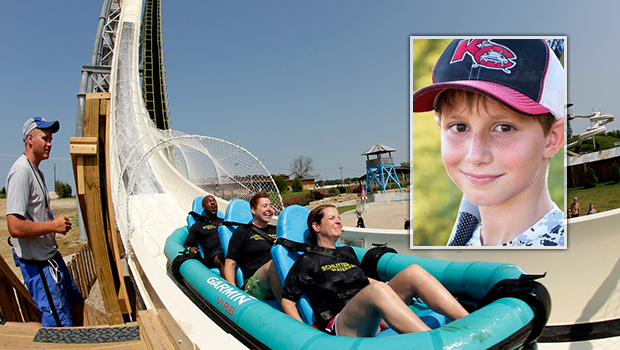 John Schooley, who designed the Verruckt slide for the Schlitterbahn Water Park in Kansas City, Kansas, made his first court appearance Monday in the 2016 death of Caleb Schwab. Schooley remains jailed in Wyandotte County after being brought to Kansas from Texas Friday. District Judge Roger Burns declined to lower Schooley's bond from $500,000 to $250,000 and ordered Schooley to surrender his passport. Schooley's attorney, Justin Johnston, declined comment after the brief hearing. Jeff Henry, co-owner of Texas-based Schlitterbahn Waterparks and Resorts, pleaded not guilty last week to second-degree murder in Caleb's death. A trial date for Henry and Schooley has been tentatively set for Sept. 10. Verruckt -- German for "insane" -- included multi-person rafts that made a 17-story drop at speeds of up to 70 mph, followed by a surge up a hump and a 50-foot descent to a finishing pool. It received national publicity when it opened at the park in 2014. The waterslide has been closed since Schwab's death. Schlitterbahn has said it will dismantle the ride when the investigation into the boy's death is complete. Schwab's family reached settlements of nearly $20 million with Schlitterbahn and various companies associated with the design and construction of the waterslide. The two women who rode with Caleb suffered serious injuries and settled claims with Schlitterbahn for an undisclosed amount.